A Quick Journey through the Bible! 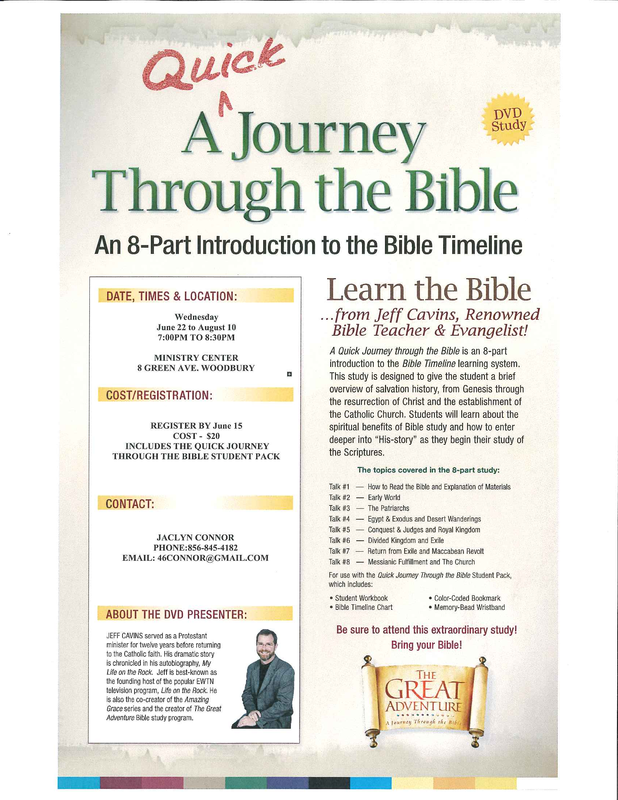 Holy Angels Parish presents once again A Quick Journey Through the Bible on Wednesday, June 22nd through August 10th at 7pm – 8:30pm in the Ministry Center. A Quick Journey Through the Bible provides the clearest, easiest, and most accessible way to understand Scripture. This study is suitable for both beginners and for those who are experienced at Bible study, because it simplifies the complexity of the Bible through an easy-to-follow narrative approach, and an ingenious color-coded Bible Timeline. It is a great way for you to get the “big picture” of Salvation History from the Catholic perspective, and to see how the Bible reveals God’s loving plan for your life. The study will include a series of eight, half-hour videos presented by Jeff Cavins. Each video will be followed by a lively group discussion. Cost is $20 for materials. For more information or to register please contact Jaclyn Connor at 856-265-3277 or 46connor@gmail.com. Includes student workbook, color-coded bookmark, bible timeline chart, memory bead wristband.